Young Энджел and her Parents. . HD Wallpaper and background images in the Герои Уолта Диснея club tagged: photo angel lady and the tramp scamp's adventure lady and the tramp 2 lady and the tramp 2 scamp's adventure disney disney sequel sequel. I had to delete an older version of this picture because I'm ashamed to say I used someone else's image of a dog that was posted here on Deviantart without their permission. They asked me to remove it and I did but didn't get around to posting a new one until now. 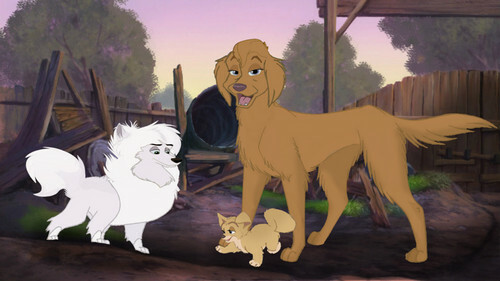 Like many of my fellow fans of Lady and the Tramp 2: Scamp's Adventure (Particularly the ones who are huge fans of Angel), I've always wondered what happened to Angel's parents. Obviously, they must've died but we wonder how they died and what they looked like. When I wrote my fanfic From Paws To Thumbs, I dedicated an entire chapter to learning more about Angel's backstory and what happened to her parents, which would explain her actions, emotions, and help with her character development in the end. If you wanna know what happened to them, you can find an updated version of my fanfic on Deviantart under the username AzulaLover1. I posted the chapter about Angel's past and what happened to her parents this morning. Check out my fanfic, if you're interested. Anyway, Angel's breed has always been one people have argued about, though she's confirmed to be a Pomeranian mixed breed. I looked up what a Pomeranian mixed with another breed that I thought she looked somewhat similar to and one that stood out was a mix with a Golden Retriever. I saw a picture of that mix breed that looked almost exactly like Angel, there will be a link to a picture of that particular Pomeranian and Golden Retriever mixed breed below. I thought that if one parent was a Golden Retriever it would have to be her mother because it would be more difficult for the mother to be a small dog and give birth to a child she had with a bigger dog without dying. I wanted their colors to mix to produce Angel's blonde color by having her father's white fur contrast to his mate's golden fur. She has her mother's eyes, nose color, and her smile. With her father, she inherited his size and curled fluffy tail. Her facial structure and fur color is a mixture of both of her parents. She also may have one ear bent to have a way of being more like her parents because of how her mother's are down while her father's are up. Sort of as a way to remember them and have them always be with her. I hope you guys like it and let me know what you think. Enjoy!